How do I manage new features in my user account as a student? Canvas is continually creating new features to improve your user experience. The majority of improvements will be made available as part of our regular release cycle. However, some features may affect your personal interaction with Canvas. This lesson gives an overview of how to manage user-level feature options for your user account. 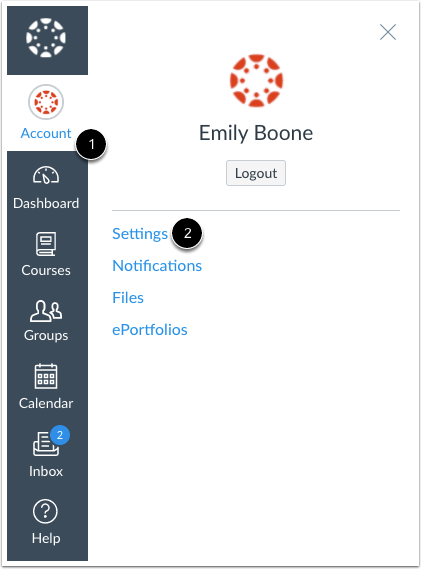 To view specific feature options available in Canvas, visit the user account features lesson. Available features will appear in the Feature Options section. Each feature includes a feature description. To expand the feature box and display the description, click the arrow icon. Feature tags help identify the state of each feature. A feature with no label  means the feature is stable and ready for use in your production environment. Features may also include a beta tag , which means the feature is available for use in your production environment but is still being tested for usability and accessibility behavior. Enabling a beta feature may create unintended behavior within your Canvas account. If a feature is displayed, you can choose to toggle the feature on or off. On : Click the toggle to turn on this feature in your user account. The toggle will turn green and show a checkmark. Off : By default, the feature will be off. Leave this button unselected if you do not want to enable this feature for your user account. Previous Topic:What feature options can I enable in my user account as a student? Next Topic:How do I view Quizzes as a student? Table of Contents > Profile and User Settings > How do I manage new features in my user account as a student?